After hearing Morsi's 157-minute speech in a downtown café, I was in a taxi going home well past midnight, when the driver suddenly slowed down while asking me; "Would you mind if we stopped here just for two minutes?" He was not really asking since he had already stopped the car next to a huge grocery store. "Sure." I said. "Would you mind if I came along?!" We both went into the shop and started buying tinned food, sacks of pasta and rice, coffee, tea, sugar, cheese and so on. Food which could help our families survive the coming round of protests and the uncertainties to follow. The wisdom is, if things get bad and there is no electricity to power the fridge, these dry supplies are best friends to a hungry family! Egyptians are bracing themselves for the worst. Ahmed, my driver, had signed a petition calling for early presidential elections. Like 22 million other Egyptians as Tamarod claims, he was approached by a volunteer on behalf of the "Rebel" grassroots campaign, and he decided to sign. On our way back, queues of cars trying to get what seems to be the last drops of fuel from Gas Stations stretched for several kilometers, partially jamming all major roads. People queued before ATM machines to get emergency cash. It was clear that everyone was getting prepared for all sorts of shortages and the eventuality of a collapse in security, similar to what happened during the January 25 Revolution of 2011. But what about people who do not have ATM cards or spare cash to buy food stocks with? What about those who barely get by with difficulty from one day to the next? Will Egypt's parallel safety net be able to provide a cushion to help them survive? I travelled through different parts of Egypt during the past few weeks. Most Egyptians, rich and poor seemed determined to get rid of the Rule of the "Morshed", the Supreme Guide of the Muslim Brotherhood's Organization. Even many Islamists like Nader Bakkar, Vice Chairman of Al Nour Salafi party, came out criticizing the Muslim Brothers and their persistent plan to single-handedly control all powers despite their limited popular support. This is not to say that the Muslim Brotherhood has no supporters. The Muslim Brotherhood is still the single most organized, well-funded and election-savvy political organization in Egypt. But it seems that young dynamic forces in Egypt and the rise of the "Connected Mind" is rendering these advantages obsolete and indecisive. Post-Democracy, or to be precise, post-indirect-democracy, is changing rules of the game. It is no longer sufficient for a clever organization to be able to get more votes than the popular support it actually commands. Winning election, it seems, can place a party in the office. But a government can be sustained only if it listens to the people it rules. In this instance, it is clear that the Muslim Brothers had deaf ears to say the least. On Friday June 28th, Muslim Brothers managed to mobilize hundreds of buses with their fans from different governorates to stage a huge rally in support of president Morsi at Rabaa El Adawia, 2 kilometers from the Presidential Palace. 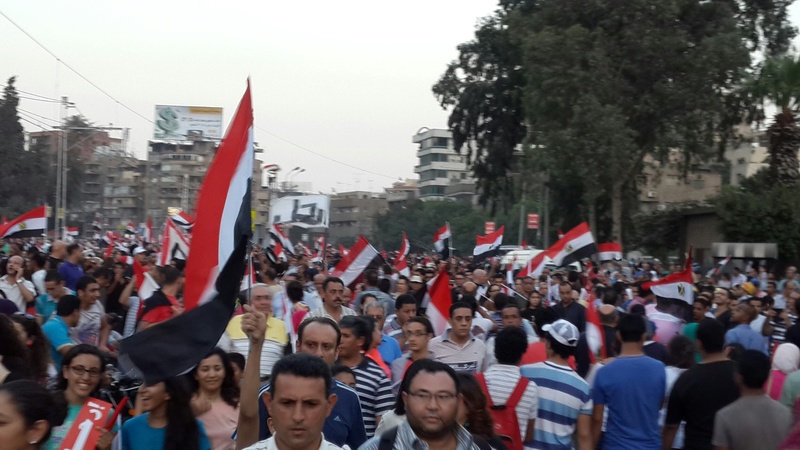 But the screen showed anti-Morsi crowds and demonstrations almost the same size, but in every major city in Egypt. One TV screen was split in nine squares, one showing the crowd supporting Morsi at Rabaa El Adawia, while the other 8 showed protesters in Tahrir, Giza, Alexandria, Mansoura, Suez, Portsaid, Mahalla, Tanta, Asuit, Menoufia and the list goes on. Demonstrations were mostly peaceful but several violent clashes still erupted leaving hundreds injured and at least five dead. This was on Friday 28th June, even before the planned protests of June 30th. But why would Egyptians continue to march on that path if they realize the risks of violence, disruption of the economy and major services, and even a possible collapse of the state, an outbreak of civil war, and the lawlessness which may follow? Is it one of these rare situations, when you realize that status quo is worse than a possible civil war? Beyond pressing economic problems and failures of Morsi, it is apparent that Egyptians started to feel a sense of losing Egypt itself. The Muslim Brothers and their ultra-conservative allies passed a constitution which nullified rights and freedoms as never before seen in any Egyptian constitution. The Muslim Brotherhood got busy trying to control all key joints of the state, appointing only figures loyal to their ideology despite of their incompetence or unsuitability for the posts. Appointment of Adel El Khayyat, a member of the Al Gamaa Al Islamiya, as governor of Luxor, where 59 tourists were slaughtered on the hands of members of his group in 1997, proved that Morsi placed the Brotherhood agenda before that of Egypt. Adel El Khayyat had to resign a few days later because he could not even set a foot in the governorate which economy depends on tourism. Angry protesters painted a graffiti on the governorate building which said: "Mr. Governor the Terrorist, Weclome to the City of Ideols," referring to the governor's comments a few months before, that Egyptian statues were pagan idols which had to be covered. Morsi also provided cover to Al Qaeda extremists in Sinai, shielding them from military campaigns designed to bring killers of 17 Egyptian soldiers to justice. Artists and writers complained that the new Minister of Culture had banned ballet and staged a 25-day sit-in with several Ballet performances in the street. Teachers complained that Ministry of Education changed all curricula removing historical accounts of liberal Egypt including women's movement, while placing text which promotes religious discrimination and intolerance. Presenters and editors at Egyptian Radio and Television Union (ERTU) complained that the Brothers control guests of their shows and the content of what they broadcast. The Brotherhood has also banned Al Azhar moderate scholars from appearing in State Radio and TV and replaced them with their own religious preachers. If the Muslim Brothers seem to be too hasty it is only because they feel that this is their last chance. That if they lose now, their enterprise will forever become obsolete. They realize how much people have changed and they want to reverse that change. But can they? Egyptians felt that the Muslim Brothers was determined to change the very nature of Egypt. Modify Egypt's cultural DNA. Alter Egypt's personality and Egyptians' way of life with the plan to produce brain-washed generations conforming to the Brotherhood's ideology. Generations who will come handy at future elections. "Having signed the petition, are you not afraid that a civil war could erupt in Egypt if Morsi is removed?" I asked my taxi driver. He replied: "I am afraid. I am very afraid. I am only a poor man and I need to work every single day to feed my family. I am afraid that Egypt will suffer in the coming days. But I am afraid more that there would be no Egypt left if the Brothers stay in power."